Sterling Silver Cliona's Wave Bracelet by Metal Arts Group. According to legend Cliona is an Irish goddess of love and beauty who possesses magical birds that heal the sick through their songs. Folklore tells of her leaving her magical home to be with her mortal lover, but is taken by a wave as she sleeps in the harbour thus the tide is known as Cliona's Wave. 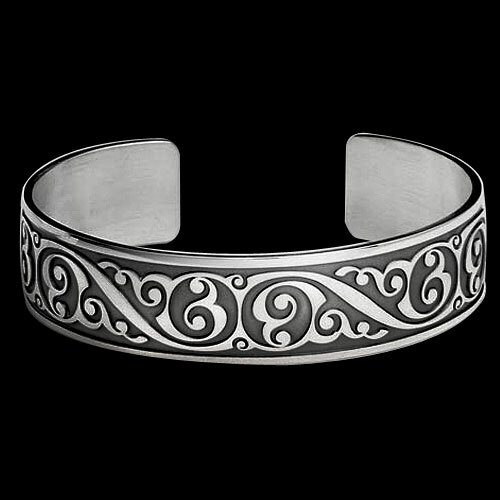 6.5 x 0.7 inch Sterling Silver Cliona's Wave Bracelet by Cari Buziak. Made in USA. Fits a 7.5 inch wrist.